Thanks a million for coming to my Master Class at the JCC in Manhattan. The truth is that i am so impressed with the incredible commitment to health from my fellow New Yorkers. It was probably the coldest day of the year and they there were 30 people waiting for my master class to start. They were interested in how my program integrates brain and body function, they were interested in which medical doctors i was working with to develop a program and more! In any case here are some of the quick snapshots of the class and how the SUPER BODY, SUPER BRAIN program started strong in 2014! 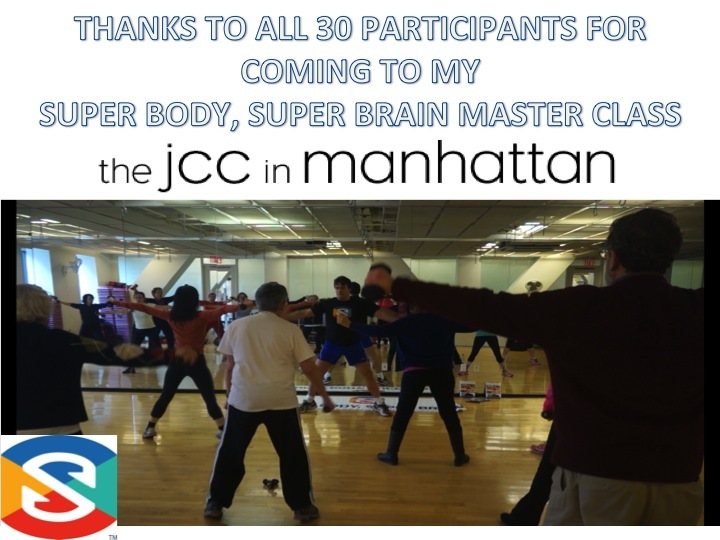 ← JCC MANHATTAN PRESENTS SUPER BODY, SUPER BRAIN CLASS ON NEW YEAR AND IS FREE!